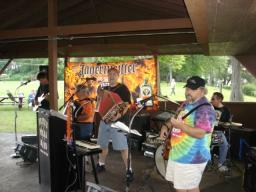 Fred and Fritz are pictured here during FPB's gig at Pulaski Park in New York Mills, NY on July 17, 2007. 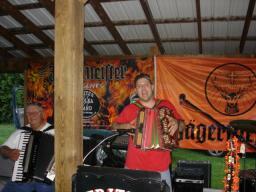 Here's a side profile of the guys tearing through a tune on July 16, 2007 in the second set. With Sid hanging from the mic stand, Fritz sings out a tune in Chapman Park on July 16, 2007 as part of hte Bridgeport (NY) Summer Concert Series. Frank dances the Austrian Wedding Dance with Kristen, during FPB's second set on July 15, 2007 at Vapor at the Saratoga Gaming & Raceway. Fritz, Rick and Gabe are shown here ripping through a tune (under the big video screen) during FPB's second set at Vapor at Saratoga Gaming & Raceway on July 15th. Rick, Fritz, and Frank raise a Jagermeister Punch birthday toast in FPB's dressing room with Charlie and Kim (& Jager Shark), as Charlie celebrated his birthday with FPB on July 15th at Vapor at Saratoga Gaming & Raceway. Rick, Kim, Charlie, and Fred are shown here during FPB's intermission on July 15, 2007. 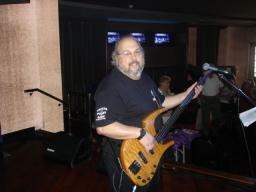 Gabe with his Parker on July 15th at Vapor at Saratoga Gaming & Raceway. 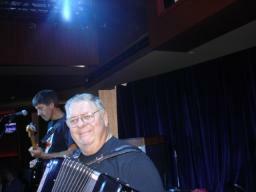 Frank and Fred are pictured here during FPB's first set on July 15th in Saratoga Springs, NY. Fritz and Rick are pictured here (along with the Jager Shark) cranking out a tune during FPB's first set on July 15th at Vapor at Saratoga Gaming & Raceway. The guys in FPB have a little toast of Jager punch in their dressing rooms, prior to their first set at Vapor at Saratoga Gaming & Raceway on July 15, 2007. 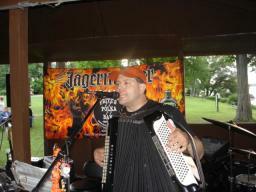 Gabe happily gave an FPB/Jagermeister tanktop to Amy, prior to the start of FPB's gig at Vapor at Saratoga Gaming & Raceway on July 15th. Fritz presents Kristen (one of Vapor's beautiful servers) with a FPB/Jager stretchy shirt during FPB's gig on July 15, 2007 at Vapor at Saratoga Gaming & Raceway. 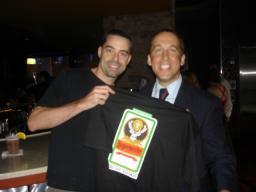 Rick presents Tori with a Jager t-shirt, prior to FPB's gig in Saratoga Springs, NY at Vaport at Saratoga Gaming & Raceway on July 15th. 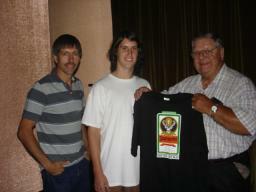 Frank and Fred present Brian (who ran sound for FPB) with a Jager t-shirt, prior to FPB's gig on July 15th at Vapor at Saratoga Gaming & Raceway.